Today in the Greater Miami Area, solar panels supply an increasingly vital source of renewable energy. Residents of this beautiful part of Florida enjoy some 274 sunny days a year on average (one reason our locale serves as an international tourist destination). Households across the area appreciate significant energy bill savings by utilizing rooftop or backyard solar collection systems. Yet the popularity of solar power raises an intriguing question: how does one clean solar collection panels? You’ve probably noticed the glittery sheen of sparkling clean solar panels reflecting the sunlight as you’ve driven through your neighborhood recently. Brilliantly clean panels enable the unimpeded collection of solar rays (technically “photons”). Solar systems convert light from the sun into electrical energy. Today many local residents offset steep monthly utility bills by feeding this power back into the grid; some lucky folks even obtain a paycheck for providing this service to their electrical utility. Why should you insist upon sparkling clean collection panels? First, the condition of the panels likely impacts your bottom line. Your solar system will generate more energy when you maintain the panels in excellent condition. They need to collect photons efficiently in order to function cost-effectively. Second, most people agree clean panels look much nicer than dirty ones. Panels marred by a thick layer of visible grime or peppered with bird droppings simply don’t showcase real estate to its best advantage. Pride of ownership prompts many homeowners to maintain their solar power system in the best possible shape. Yet in considering solar collection panel maintenance, safety must assume a paramount consideration. Currently, most property owners install these devices along rooftops. Simply accessing your system’s panels may require a ladder, a crane, or scaffolding, depending upon the layout of your residence. Two safety factors to consider in contemplating cleaning efforts include the height of the panels from the ground and issues associated with wind. Both of these factors may pose challenges for anyone considering cleaning a solar collection panel. Additionally, cleaners need to beware of coming into contact with electrical and power lines nearby. 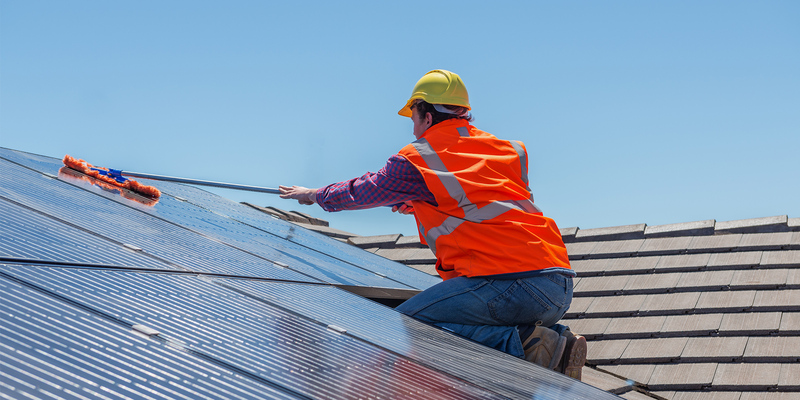 Before undertaking any solar collection panel cleaning efforts, it generally proves wise to contact the manufacturer or panel installation company to obtain specific cleaning directions. Remember, just like any other home system, solar systems don’t always use the same components and products. Individual manufacturers may issue specific cleaning guidelines for their merchandise. It makes sense to check with your installation firm and/or system manufacturer before authorizing any solar collection panel cleaning efforts. You need to ensure you know the correct recommended cleaning method for your specific system. Additionally, you don’t want to inadvertently void any warranties by employing the wrong cleaning techniques. Pay particularly close attention to safety instructions. For instance, do you need to turn off your home’s power system first before performing cleaning? How many times per year does your collection system require cleaning, per manufacturer instructions? And do your panels benefit from dry cleaning using a microfiber cloth, or from some other cleaning technique to maintain them in optimal condition? After obtaining specific cleaning instructions for their panels, Miami area residents face an important decision: performing DIY cleaning, or contacting a professional cleaning service. The specific choice you make may depend upon a number of factors. How much time do you have to devote to panel cleaning? Do you feel comfortable undertaking this specialized type of project yourself? Have you invested in the tools and supplies required to perform solar collection panel cleaning safely? 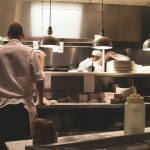 Answering these questions may help you select the best cleaning options for your circumstances. The ability of an individual panel owner to perform cleaning efficiently may vary based upon rooftop cleaning experience, age, physical condition, health concerns, and available tools. Not surprisingly, many property owners prefer to delegate this cleaning project to experts. Sparkling solar collection panels contribute to the beauty of a home or business; yet most owners do not need to perform this type of challenging cleaning on a weekly basis. If you retain a skilled specialized panel cleaning service, the company can add your address to its service route and perform cleaning at intervals recommended by your solar system manufacturer. We’ve become a leading name in solar collection panel cleaning in the Greater Miami, Florida Area. Kleanway Cleaning Service tackles this type of specialized project for customers on a daily basis. With expertise in washing and sanitizing residential exteriors, we make every effort to furnish superb solar collection panel cleaning services, too. Our company has invested in extensive cleaning equipment, tools, and supplies. We remain dedicated to the ideal of supplying complete customer satisfaction. Our focus upon providing exceptional customer service makes us an ideal choice to choose as your preferred cleaners. When the time arrives to designate a company to supply solar panel cleaning services, we hope you select us! You obtain an additional advantage by relying on Kleanway Cleaning Services. Did you know, we also perform skilled exterior building cleaning for businesses and homeowners in the Miami Area? 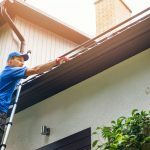 You might find it useful to schedule solar collection panel cleaning and driveway and siding powerwashing services during a single service call. We’ll complete these projects for you efficiently. We think our competitive rates will delight you, too! Have you decided to request panel cleaning in order to help maintain your solar system in great condition throughout the year? Simply go ahead and contact us now. We’ll add your address to our regualr service roster.